Pigmented lesions basically refer to a disorder in or on the skin, which changes the appearance and color of the skin as compared to the other part of the skin. Lesions or patches are usually black or brown in color. There is no risk of all such things in the laser removal of tattoo. The process is fairly simple. The tattoo is exposed to the laser rays which are absorbed by the tattoo paint. The rays destroy the tattoo ink molecules and hence remove the tattoo. Usually 2 to 4 sittings are required for tattoo removal surgery. 1. Keep skin away from the reach of the sun’s rays. 2. Use a sunscreen lotion every time when you go out in the heat. 3. Use pigmentation sprays, face washes and other medicines. 2. Carbon dioxide (CO2) laser technique. 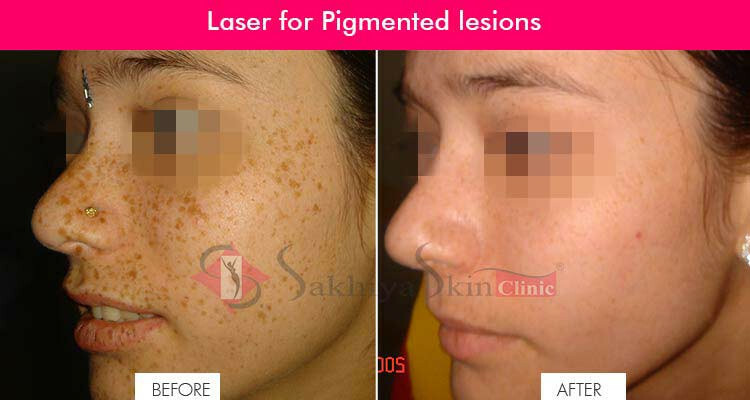 Regardless of the cause of the lesions, laser technique is one such non surgical option that is used for treating the pigmentation and moles. The pigmented lesion caused by the deposition of excess and unwanted melanin in one area of the skin is exposed to short pulse of visible laser light due to which the inner temperature of melanin gets raised up and cells producing much of melanin gets shattered. After that body of the individual develops new cells replacing the old ones in that area; the pigmented region gets completely treated and appears like a normal one. Laser technique does not involve the usage of any operative instruments, is effective and time saving. • HEAT Much exposure to heat or ultraviolet (UV) radiations is one of the prime reason that affects the melanocytes (the colour determining cells) resulting in pigmentation. • INJURY Sometimes after getting injured, the wound still possesses slight inflammation and so this inflamed area develops into pigmentation further. • DISEASE Certain diseases affect the colour of the skin like in cases of Jaundice. Later these become responsible for the formation of lesions. Even Stress, poor circulation of blood and pregnancy are other factors that engender pigmentation. Also, the lesions can be precipitated by the improper functioning of the blood cells and hormonal imbalance. WHAT ARE THE CAUSES OF DARK SPOTS ON FACE? Environmental factors , hormonal changes, UV light, sun spots, medications, pigmented lesions etc. HOW DOES LASER REMOVE DARK SPOTS? Laser is easily absorbed by the skin. It helps in removing irregular damaged skin cells and stimulating new skin cells to give way to light and young-looking glowing skin. HOW MANY TREATMENTS WILL I REQUIRE FOR THE REMOVAL OF DARK SPOTS? Average 6-12 sessions are required depending on pigment severity, medication, extent of sun damage etc. I HAVE CLEAN SKIN. CAN I GO FOR SKIN WHITENING TREATMENT? Yes! Laser is a fast effective method to reduce melanin pigmentation and aims at achieving light skin tone/lightening. All lasers are safe if conducted under expert supervision. Apply ice religiously for 2 days post the laser treatment. Use sunscreens above SPF 30 and moisturise the skin properly. Avoid hot showers and swimming. CAN I AND MY FRIEND GO FOR LASER? Yes. Laser works for all skin types, uneven skin tone, on age spots, dark spots, freckles and melasma. It can lighten your natural skin tone.